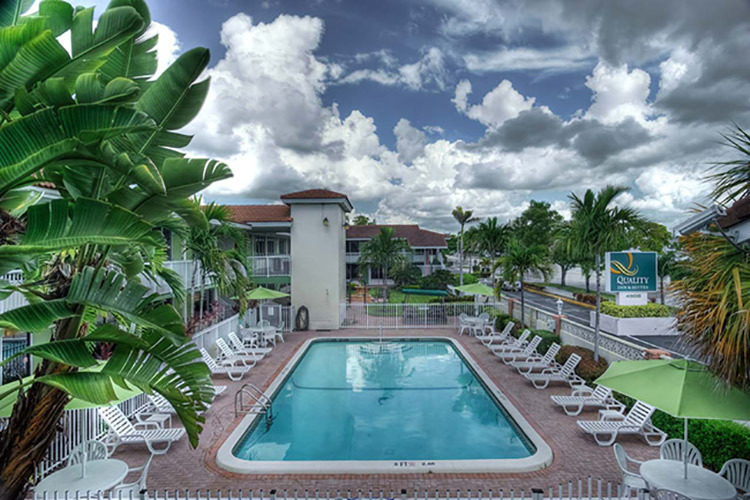 (HOLLYWOOD, Fla.) – Quality Inn & Suites - Hollywood Blvd & Port Everglades Cruise Port, a budget-friendly, full-service cruise port hotel in Hollywood, Florida, near Port Everglades cruise port and the Fort Lauderdale/Hollywood International Airport (FLL), has been awarded the prestigious 2016 White Glove Award -- an award this cruise port hotel has received every year since 2010. The White Glove Award is a yearly award given to small and private hotels of 50 rooms and under who offer an exceptional level of service to guests. Every year since 2010, the Superior Small Lodging Association (SSL) has recognized this Hollywood cruise hotel for exceptional cleanliness, organization and customer service. On a daily basis, Quality Inn & Suites - Hollywood Blvd & Port Everglades Cruise Port welcomes guests from all over the world. Guests staying at the hotel are comprised of cruise passengers departing from Port Everglades and the Port of Miami, sports fans catching a football game, concert or event at the Hard Rock Stadium, or simply vacationers looking to enjoy South Florida's sunny, tropical climate and year-round pleasant weather. "To win the White Glove Award for the sixth consecutive year is quite an honor," stated Izzy Fintz, Hospitality Manager at Quality Inn & Suites - Hollywood Blvd & Port Everglades Cruise Port. "All of us earned this award with hard work and an uncompromising dedication to a superior guest experience."